AFSC 1U0X1, Unmanned Aerospace System (UAS) Sensor Operator was officially established by the Air Force on January 31, 2009. The First group of students to go through the new course, started training in August 2009. UAS Sensor Operators perform duties as a mission crew member on unmanned aerospace systems. They employ airborne sensors in manual or computer-assisted modes to actively and/or passively acquire, track and monitor airborne, maritime and ground objects. Qualified personnel conduct operations and procedures in accordance with Special Instructions (SPINS), Air Tasking Orders (ATO) and Rules of Engagement (ROE). Crewmembers assist UAS pilots (who are commissioned officers) through all phases of employment to include mission planning, flight operations, and debriefings. Conducts reconnaissance and surveillance of potential targets and areas of interest. Detects, analyzes and discriminates between valid and invalid targets using synthetic aperture radar, electro-optical, low-light, and infrared full-motion video imagery, and other active or passive acquisition and tracking systems. Assists in air navigation, Air Order of Battle (AOB) integration, fire control planning, and determining effective weapons control and delivery tactics to achieve overall mission objectives. Receives target briefs (9-liners) for weapons delivery. Conducts immediate first phase Battle Damage Assessments (BDA) for up-channel coordination and potential reattach. The operator utilizes laser target marking systems to provide target identification and illumination for onboard weapons delivery, and in support of other combat assets. The individual is also responsible for terminal weapons guidance. Performs pre-flight and in-flight mission planning activities in accordance with unified combatant command and theater rules of engagement. The qualified operator must understand tactics, techniques, and procedures (TTP) for friendly and enemy AOB assets. They also operate mission planning ancillary equipment to initialize information for download to airborne mission systems. Receives, interprets, extracts, and disseminates relevant ATO, Airspace Control Order (ACO) and SPINs information. Participates in the post-flight debriefing to establish mission accomplishments and potential procedural development. Researches and studies target imagery, friendly and enemy orders of battle, and offensive and defensive capabilities from various sources. Assembles target sources. Assembles target information, locates forces, and determines hostile intentions and possible tactics. Conducts initial, qualification, upgrade and continuation training for mission crew members. Individuals perform training, planning, standardization and evaluation, and other staff duty functions. Performs staff assistance visits to subordinate units. Tests and evaluates capabilities of new equipment and propriety of new procedures. Aircrew Fundamentals Course, Lackland AFB, TX, 4 weeks. (Tech School): Randolph AFB, TX for 21 class days. AF Technical School graduation results in the award of a 3-skill level (apprentice). 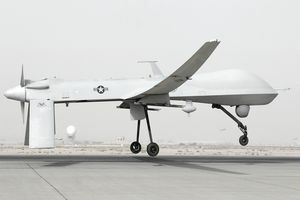 UAS Fundamentals Course, Randolph AFB in Texas: Students are paired up with UAS Pilot trainees, and go through this course as a two-person flight team. Upon graduation from the UAS Fundamentals Course, students proceed to crew qualification training at Creech Air Force Base, NV, for an upgrade to the 5-skill (technician) level. This training is a combination of on-the-job task certification, and enrollment in a correspondence course called a Career Development Course (CDC). Once the airman's trainer(s) have certified that they are qualified to perform all tasks related to that assignment, and once they complete the CDC, including the final closed-book written test, they are upgraded to the 5-skill level, and are considered to be "certified" to perform their job with minimal supervision. For this AFSC, 5-level training averages 16 months. Once they receive their 5 skill level, they either remain at Creech for an operational assignment or proceed to another base for their first operational assignment. Upon achieving the rank of Staff Sergeant, airmen are entered into 7-level (craftsman) training. A craftsman can expect to fill various supervisory and management positions such as shift leader, element NCOIC (Noncommissioned Officer in Charge), flight superintendent, and various staff positions. For the award of the 9-skill level, individuals must hold the rank of Senior Master Sergeant. A 9-level can expect to fill positions such as flight chief, superintendent, and various staff NCOIC jobs. UAS's are the new "in" thing in the Air Force, so expect this list of assignment locations to expand. What Are the Air Force Enlisted Jobs?